There's nothing like seeing your kid reach their childhood milestones. 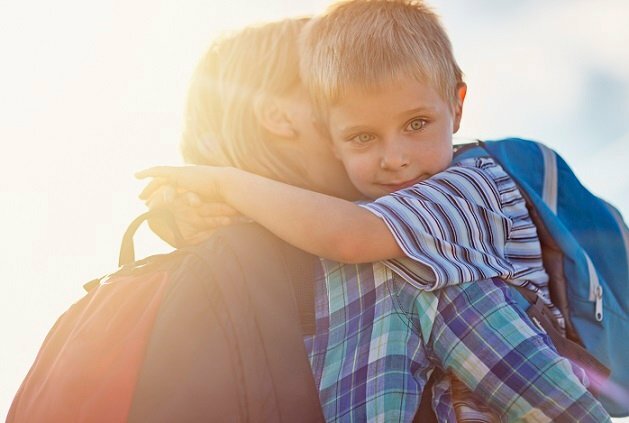 Who knew being a mum is all about saying good-bye? At first, I was proud, and then I realised it would be his last. My seven-year-old finished year one this year. I was filled with sadness at the thought that he was no longer a ‘little kid’ – that he was growing up too quickly. The thought that year two was approaching made me apprehensive, it is sure to be tougher, more will be expected of him. I sobbed fat, warm tears at the thought it was over, at how difficult this ending was. And then I remembered this time last year when he finished kindy and feeling exactly the same. I remember the overwhelming sadness I felt that his first year of school was over. Never to come again. What I have realised is that life with kids is a chain of lasts. A bittersweet series of saying good-bye. Do you remember that first year? Those milestones so beautiful and yet so heartbreaking at the same time. "Oh, the longing to prolong their babyhood." The first smile, the first time he rolled, the first time he sat up, the first word. And with every moment of pride and excitement was that jaggered edge that your child was no longer a baby, never again would there be a first smile, a first laugh. It’s a hard feeling to combat. You know you are meant to be delighted and happy and you are, but, at the same mixed-up time you are bloody sad. It started for me in the first week. I remember taking my first son home at four days old and feeling bereft that the first few days were gone and I wasn’t getting them back. It continued at each turn, I breastfed my children and with all of them when it came the time to wean I felt indescribably sad that the relationship was over. Oh, the longing to prolong their babyhood. Every teeny tiny item of slightly yellowed baby clothing I folded into the “donate” box was pressed down with a sense of sorrow. When the high-chair went, when the pram was passed on to a neighbour, when the baby bottles dived into the re-cylce bin how was I to know that was just the start? No one prepared me for the last day of pre-school, the last concert for baby ballet, the last gymnaroo class. No one told me about how deep the loss would be when they walked away on that first day of school, backpack filled with raincoats and jumpers and shiny water bottles tucked up next to a tiny heart shaped note lying on top of a jam sandwich. No one warned me how I would feel when I no longer needed to walk in the gate, instead to just drop and run. "No one warned me how I would feel when I realised they were growing up way too fast." I know that being sad at these endings is facile and pointless as the next stage is just as rewarding. I know our children interact more, and play and laugh with you while they develop their own personalities. I know as time goes on our relationship only deepens. And as they mature and learn they become little people we are proud of as well as love but, I tell you, I just can’t shake it. God help me when the real milestones occur, the last day of primary school, moving out of home, 18th birthdays or a 21st. But maybe by then I would have learnt a mechanism to deal with it. I hope I have. I know that part of motherhood is learning to accept these endings and teach yourself how to say goodbye with pride rather than sadness. But I am not there yet. Not even close. Until then my heart will be heavy with each and every ending, I will sob at the lasts while pretending to be brave. So hold my hand fellow Mums. I need you. How did you feel when your "baby" grew up?